As a regular Internet user, you surf the internet a lot, most of the time you are either busy on Facebook looking for your old friends or on Instagram uploading your pictures so that your followers can see. 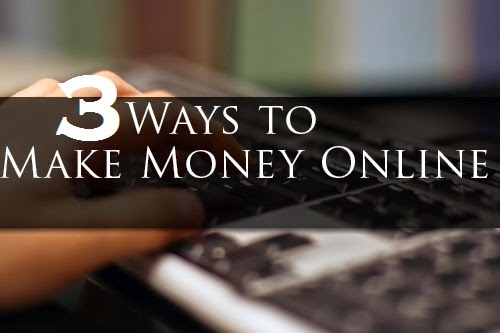 But have you ever thought about one or two things you can do to make money online ? Yes,the right and legit way, not scamming or spamming people. If you never knew or you think it’s impossible to make some bucks online, then I’m telling you that it is very possible, in fact, you might end up building your dream house or buying the beautiful car you’ve always loved & admired in those Hollywood movies (regardless of your age, race, background etc.) with the online businesses I’m about to show and explain to you. Although, most of us have seen and heard of some of these businesses before but we have wrong perspectives about them, maybe because most of the eBooks, online articles, blog posts and the likes we’ve read promised us to be rich overnight or maybe in a week. Ooh no, it’s impossible and we all know that. Rome wasn’t built a day, was it? Something very important you should put in mind while reading and venturing into any of these businesses is that you must possess at least 3 of the following attributes to succeed or all of them to be the best: Patience, Confidence, Hard-working, Intelligence, Passion, and Goal-oriented. 1. Blogging – Don’t be surprised this is the first on the list. It really worth being the first on the list because it can turn you into a six-figure earner, do you know what I mean? $100,000 is the lowest six-figure income you could earn online because even $99,999 that seems so close to it is not a six-figure income. Blogs like Huffington Post, Mashable, Problogger etc. are making millions of dollars annually [even though they are now big blogs with huge number of employees, they also started from nowhere] while so many upcoming, professional & devoted Bloggers are earning between $100 - $10,000 monthly yet still improving & increasing their earnings. Even though the aforementioned cases show how profitable blogging seems to be yet there are thousands, even millions of abandoned & lifeless blogs just because their owners don’t make money with them or because some of them make less than $20 or $50 with them monthly. These bloggers probably lack some or even most of the attributes we mentioned earlier, that’s why their blogging adventure failed and in addition to that, they might be unable to get the necessary help they needed while blogging, leading to their failure. Thanks to God that you stumbled upon this post and this blog itself, because we’ll be walking you through the necessary steps and actions to take in order to make your blogging career a success with series of enlightening articles which will help you. You could just subscribe to our free email updates using the subscription form below, so that you won’t miss any of our useful and important updates in the future. 2. Online Importation Business – You’ve probably gotten a glimpse of what this one is all about with the keywords in the title itself. Even though it is being listed under online businesses yet it has its offline part too because it involves buying goods and items at a very reduced price online from abroad and selling it locally online or offline at a very reasonable and increased price. If you are business-oriented and have good marketing skills then you’ll find this business interesting and full of profit. Also, this business seems to be more ideal for those residing in Nigeria, Ghana, Indonesia, India, Pakistan and some other African and Asian countries since the goods & items (which includes Smartphones, Electronics, Jewelries, Outfits etc.) will be mostly imported from United States, UK, Germany, Dubai, China and some other developed commercial countries or territories. Who knows maybe you’ve purchased some expensive eBooks which proved to be useless and not bringing the desired results, sorry about that, but still - don’t worry be happy. I’ll be helping and guiding you online for free on how to partake in this business successfully while making money with it at the same time. What you just have to do is subscribe to our free mailing list below so that you’ll be getting all our importation business updates and other useful updates directly into your mailbox. 3. Fiverring – Damn! It looks like a new word to you? Yeah, maybe it is, because I don’t see people using the term ‘fiverring’ as often as they do with ‘blogging’. Well, fiverring is the process whereby you use fiverr as a medium to offer people the services and skills you’ve got for $5. Are you thinking – ‘What the heck will $5 do in your life?’ If you don’t know, this same $5 has turned so many people into millionaires. Can you imagine how much you’ll earn when you get 1000 orders in just a month or even a week at the rate of $5 per order? That’s a whooping sum of $5000 which finally results to $4000 when fiverr removes their own $1 charge on each order. You may not have the clear idea on how fiverr works for now but just stay tuned to StevenBergy.Com.Ng [SBCN] as we explain and guide you on how to make money online through Fiverr. Note that there are still other ways to make money online but the aforelisted ones seems to be the most profitable ones at the moment. Henceforth, we’ll be rolling out series of articles, blog posts and free eBooks on How to create a blog and make a living with it, How to start online importation business and make huge profit from it, and how to make money on Fiverr offering simple and stress-free services you are well acquainted with. Sharing is caring, show your family and friends you care by sharing this important post with them using the share buttons on this page and kindly share your thoughts, opinions and contributions using the comment box at the bottom. Don’t forget to join us on Facebook, follow us on twitter and add us on Google+, better still, our subscription box is widely open for free updates below. Hope this helps. Blessings !!! Thanks for the comment Sanjith but we're sorry we removed it because it has a link which looks unsafe (referring readers to buy) for our precious blog readers. You can re-comment without the link. Peace !